MF DOOM and Madlib are Madvillain. The two met in 2002 and soon began working on Madvillainy which would be finished over the next year and released in March 2004. 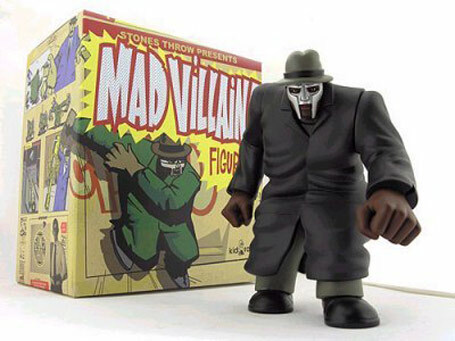 The music on Madvillainy went against the grain of all popular conventions in contemporary hip-hop: short songs, dirty sound, no choruses, and with lyrical themes which were not always clear to everyone on first listen. The album received the highest critical praise of a hip-hop album released in 2004, and years later has continued to generate interest and controversy. MF DOOM went on to work with DANGERDOOM (with Danger Mouse), Gorillaz and Ghostface Killa. Madlib has continued developing his diverse production style for the likes of Erykah Badu, Talib Kweli, Ghostface, as well as releasing several solo products under his own name and self-made creations Quasimoto, Yesterdays New Quintet and Beat Konducta. In 2008, prolific as usual, Madlib remixed Madvillainy in its entirety. It was released in a limited edition box set in 2008. DOOM and Madlib have worked on a second Madvillain album on and off for several years. If you're waiting for it, wait in line behind us. + News DOOM IN XXL: BACK LIKE THAT "The masked villain’s latest project Key to the Kuffs with Jneiro Jarel is vintage DOOM, minus the MF…"
+ News DOOM. GOV'NOR. VIDEO. + News Madvillainy without the raps: still a classic DOOM + Madlib's Madvillainy now released with full album cover.